Serena Dorothy aka ‘Dot’ Ryan leverages online presence to maximise ROI on Facebook Ads. Serena Dorothy aka ‘Dot’ Ryan is an award winning Digital Marketer who approaches digital marketing as the cost effective key to achieve your goals personally and professionally. 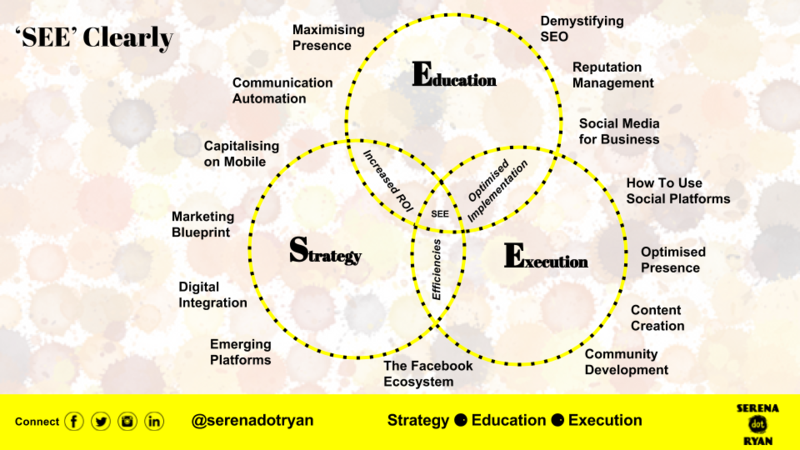 After creating Serena Dot Ryan® in 2014, a digital agency specialising in Facebook Ads optimisation, Serena has become know for explaining often complex processes simply. Serena comes from a non-tech background and relates to people from beginners to experts. This is backed up by Serena being invited to speak to everyone from Small Business Owners and Entrepreneurs to Web Developers. With knowledge people can make the most of what they have available to them, essentially saving them time and money. Serena enables people to harness the power of digital knowledge for direct business benefit. Serena Dot Ryan® is dedicated to enabling business productivity, sustainability and economic growth through delivering the ‘SEE Digital Clearly’ approach. If you have a specific requirement, please do let us know.